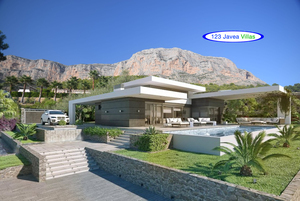 A hand picked selection of Modern New build Villas for sale in Javea Spain. The Costa Blanca north is now one of Spain’s most popular locations to design a dream new build or off-plan property for sale in Jávea. Clients can now expect new construction in Javea Costa Blanca with high quality chic sharp architectural designs along with exclusive affordable locations such as La Perla Javea, Monte Olimpo, Villes Del Vent, located 2 kilometers from the main beach, or Villes del Vent, building plots and projects with sea and mountain views, located between Javea and Benitachell, new build properties in these locations range from 499,000 to 1.500,000 Euros. 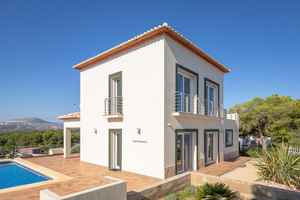 Javea or Xabia is the perfect setting for a new build modern design property. These new building projects in Javea are ideally located in the prestigious La Perla urbanisation, just a short drive to the main Arenal beach area of Javea and close to supermarkets, shops and all amenities, we have a choice of 25 building plots for you to choose from, all with amazing views of Javea Bay. The villas are built to a high specification including, underfloor heating, full air conditioning, home automation, fully equipped kitchen, all of your own choice and design. Please let us know what type of property you are looking for, as we have additional properties that are not listed on our site.